Doing your own public relations work and outreach – whether you’re a novice or an expert – is time-consuming and involves multiple steps and tasks, from research to pitch and image creation to oh-so-many-levels of organization. That’s why I get high-five level excited about tools and apps that allow me to make the work more streamlined, effective, efficient, and fun! Yes, PR can be fun – especially when it starts to flow and you begin to see results. Now I know that this title is a little bit, well, dramatic, but I’ll be honest, I am guessing that if *I* rely on these tools to simplify my PR work, you could probably use insight into them as well! 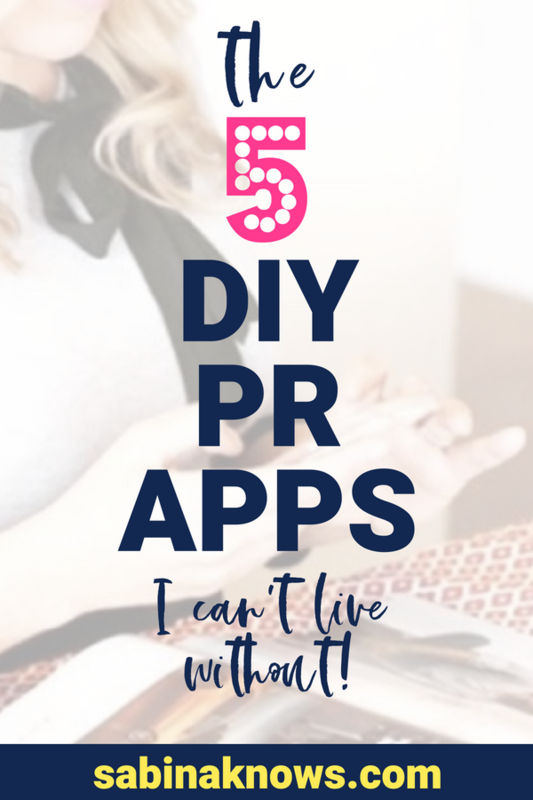 Dive in below to get the scoop about the go-to PR apps I cannot live without, as well as a breakdown of how I use each of them in my publicity work. After you read the tips BE SURE you’re in my Facebook community so I can keep small biz fairy dust like this raining down on you on a regular basis! Texture is my go-to tool when it comes to doing PR research – and it’s quickly becoming a favorite of my PR students as well – because it literally brings the monthly magazines you need to read, research, and get to know- even hope to appear in – to your fingertips. Even better? After a FREE 30 day trial, the app is only $9.99 a month which is basically the cost of two magazines “over the counter” these days. Not only can you instantly read current issues of magazines on your iPhone, iPad or desktop computer, but you can also “go back in time” months – even years (to 2017, 2016, etc.) – to review past issues, which is incredibly helpful when you’re trying to get to know a magazine’s columns, voice, style, and layout. Finally, one totally not-related-to-PR benefit? I love not having those annoying paper subscription ads falling out all over my house (hello: waste of paper), as well as the ability to skip over the ads and sections that do not apply to me, and get to “the good stuff” content-wise that I want to dig into. Read through the past few issues of magazines to get a sense of how and where they cover businesses or experts like yourself, in order to better target your outreach and offerings to them. Use the Texture app to figure out who at the magazine covers your beat via the masthead or bylines of their articles. Search specific content topics or themes related to your business (for example: jewelry, IVF, pets, budgeting) and you’ll see which magazines cover topics like this and how they’ve talked about them recently. Use the app’s vast list of magazines to expand your knowledge of what magazines are out there and which could be good homes for your story – no trip to Barnes & Noble required. Sometimes we dwell on one or two publications when there are heaps of other options out there that could be fantastic digital homes for our stories! “How you do anything is how you do everything”. Every email, pitch, social media post, press release, blog post – you name it – in which you’re writing about yourself or your brand is saying something about you and your business. If your copy is unclear or filled with spelling errors and grammar mistakes you’re not saying the right thing. Unfortunately, not all of us are copyeditors, nor can we afford them on staff. I’ll be the first to admit that even with the best of intentions, typos slip into my work as my fingers fly across the keyboard, and I cringe when I see them in own work or that of other people whose content, posts or pitches I’m checking out. Enter Grammarly: This will edit any type of copy you’re writing in real time, and it does it in such an intuitive way that your workflow and creativity aren’t stifled. Soon you’ll wonder how you ever lived without it! Download the app and let it automatically edit your copy as you do social media posts, write blogs (it will edit the draft as you compose it), and as you craft your marketing emails. Be sure all of your press correspondences – from emails to pitches to marketing materials – are fully edited before you press send. Give your brain a rest by letting a “pro” act as your copyeditor – you have enough to think about already! A picture can speak a thousand words – in your pitches, on social media, your newsletter, and even InstaStory. That said, I know I’ve never mastered photoshop (and trust me, I’ve tried – and lost too many hours to YouTube tutorials). That’s why I love Canva above all photo-editing and creating tools. In my opinion, Canva should be your top pick when choosing a creating images, designs, and graphics because it is beyond intuitive (sometimes it’s so easy I think “this can’t be real”) and from its endless customizable templates to its ability to share your creations with other people on your team, it will soon become an app you use almost daily. Trust me. For example, this week I created graphic covers for my InstaStory highlights. Using Canva’s library of graphics and simple image sizing tool, I had it all done – by myself! – in less than twenty minutes! Canva for the win! Create collages to feature in your pitches – this is especially useful if you’re a product-based brand and want to showcase more than one image in a pitch but do not want to attach multiple jpegs to one email (poor PR form). Experts you need graphics too! A collage of you “in action” demonstrating what you’re pitching, or images that represent the concept you’re sharing with the media can help your recipient visualize the story you’re offering. Create branded posters and graphics for your social media feeds. Canva will actually save your brand colors so you can input them into their premade graphics – one less step for you to think about! Speaking of pre-made templates and graphics – Canva is SWIMMING in them – use them for your social media, blog, and newsletter – all of these marketing tools are an essential part of your brand building “soup” – and Canva’s professional level templates can be customized using simple drag and drop features. They’ve even got the correct measurements laid out for you for Facebook, Twitter, newsletter headings and more. Upload your own photos and colors into them for extra personalization and you’re good to go. The finished product will look like you hired a fancy graphic design agency to create them, and you’ll be beaming with pride when you’re done! InstaStory covers! Like I said above, InstaStory covers for your highlights can be created in minutes with this app, and they’re a game changer on your Instagram profile page because they visually guide (more like lure) the eye of people on your feed to click on the highlights you’ve created! I have a question for you: How are you housing, organizing, and saving your public relations work at the moment? Do you save email correspondences “in your head”? Are you taking notes on pitches and follow-ups on Post-its? Is your campaign plan printed out and buried somewhere in a pile of papers in your office? Digitizing your outreach spreadsheets, your work documents (pitches, press releases, and more) not only keeps them safe and sound, but it gives you the freedom to tap in and update them anytime, from anywhere – even your mobile phone! Create and store a digital PR Home Base in Google Drive to instantly access your campaign plan, media contacts, organize your media outreach tracking and ensure you never lose a media contact again. Keeping copies of all of your pitches up-to-date, online and filed away for you and your team to access. Give everyone on your team (if it’s only you at the moment remember will most likely expand in the future) access to the same version of a document – which you can all view at the same time. Engage in status updates that save in real time so you’re always caught up and everyone is on the same page. Not-so-fun-but-but-totally-true-fact: You won’t always be alerted to every press “hit” and publicity moment you receive in real-time. In fact, some editors, journalists, and bloggers – especially those who create online content – aren’t even aware of when your story will go live until it IS live! But it’s essential that you not only know when stories about your business and you, yourself, are going live so you can track them, but you also need this information so that you can leverage them into even more buzz, sales, and opportunities for your brand. So how do you monitor the web to make sure you’re never missing a beat when it comes to tracking your publicity as it happens? Google Alerts! Set alerts using Google and every time you or your business are mentioned online they will email you this information to the email address of your choice – I select the real-time ongoing alerts options – which means I”m alerted via email the moment my name or my company pops up online. Set alerts for your full name and business name – even specific product or service names, as you may appear in the press in different ways. Are you trying to track your competition? You may want to “Google Alert them” as well! Monitoring what a celebrity you hope to work with is doing? Try tracking them via Google Alerts! I’ve shared my top five apps for doing my PR work and now I’m curious: Are there apps or tools that help streamline and improve your own PR work and media outreach? Share them in the comment below this post! Also, be sure you tag me in photos of yourself in action using these apps (via @SabinaKnows and @PressforSuccess)!